After two full days in Key West it was time to pack up and hit the road. 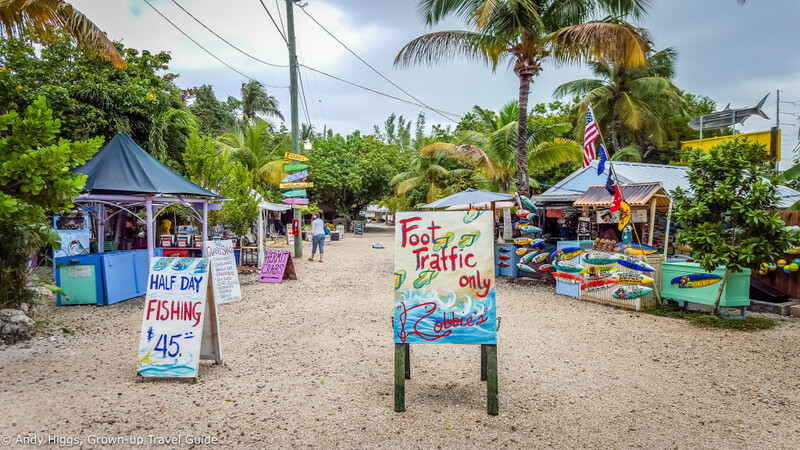 The only road out of town, the Overseas Highway. 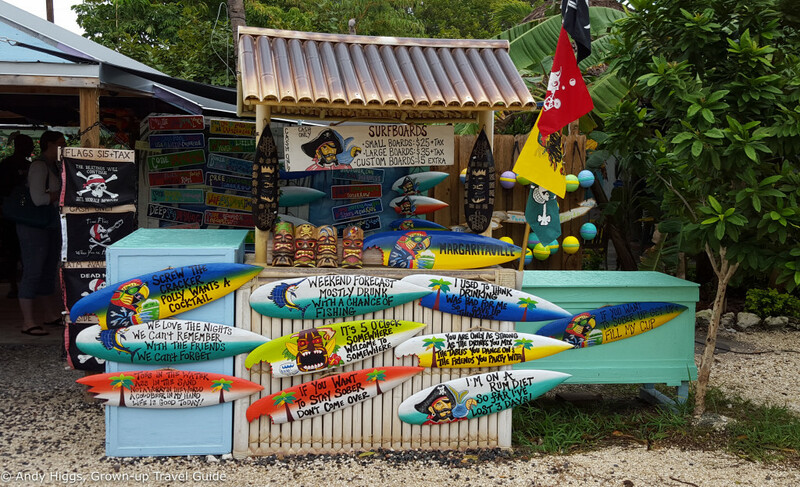 For the rest of our trip we would be exploring the Middle and Upper Florida Keys from a base in Tavernier. As it always does, the weather turned for the better as we were leaving so we wished that we weren’t. Such is life – I just take it as another reason to return. We had a final big breakfast at Ibis Bay before piling into a very comfortable minibus for the ninety minute scenic drive to our first stop. 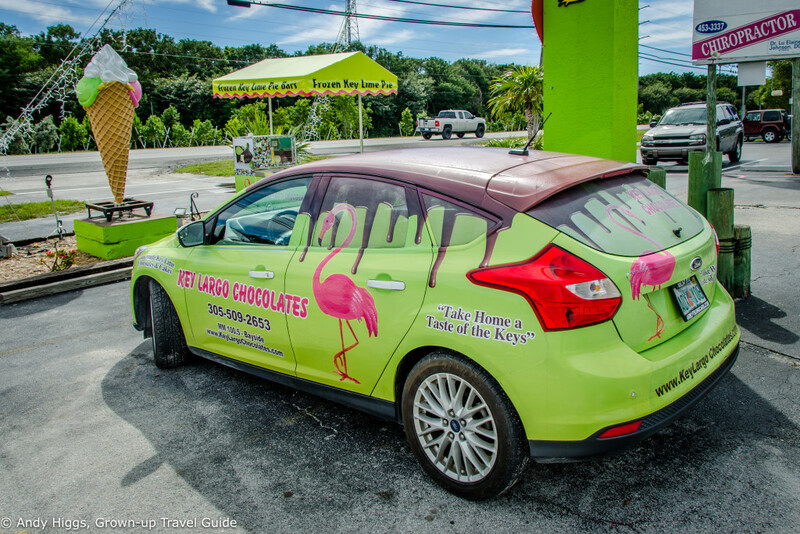 On my last trip to Key West we had driven directly to and from Miami, only pausing on the way for coffee, ice cream and to shelter from a couple of insane thunderstorms. 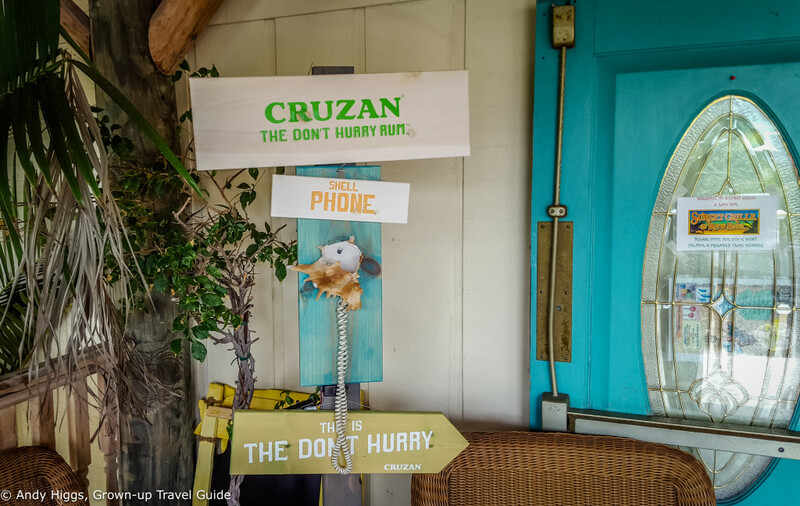 I was really looking forward to seeing more of the Keys – and even held out a vague hope of bumping into some of the stars of “Bloodline” which was being filmed there and then. Anyway the drive northeast was as wonderful as I remembered – after leaving Key West there’s not much more than the road itself and a thin strip of coastline on either side so the views are amazing. 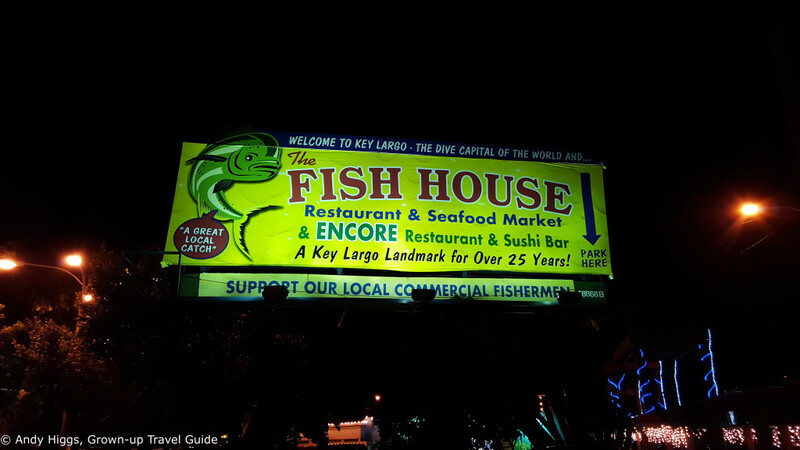 We passed through a number of small Keys dotted with hotels, homes and stores and scores of people fishing from piers. Where the road took a different route from the old railroad we could see the remaining bridges standing proud – if a little battered from the Florida weather. 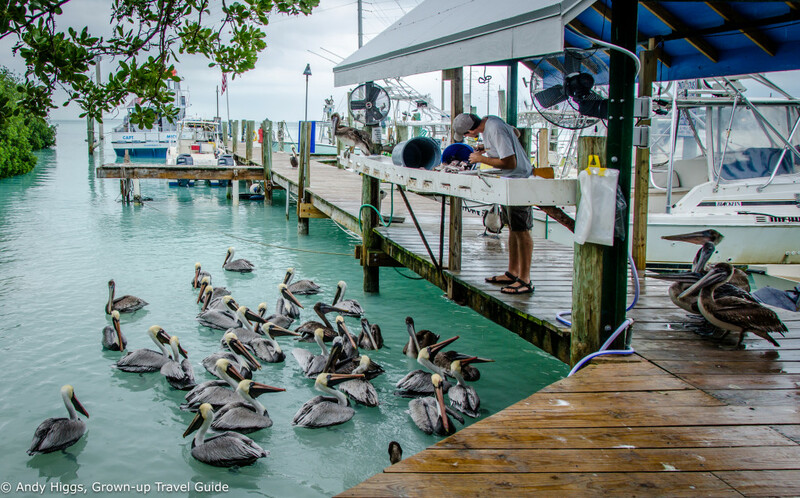 Two of the largest islands in this section are Sugarloaf Key and Big Pine Key – the first of which contains most facilities you might need as well as a classic eatery, Mangrove Mama’s. Big Pine is famous for being the home of the endangered (and highly protected) tiny Key Deer – be careful when driving as they are prone to wander onto the road. Shortly after Big Pine Key is perhaps the best State Park in the Keys – Bahia Honda. It has a superb sandy beach (a rarity in the area) with views of the Old Seven Mile Bridge and is a great place for snorkelling. We drove past the entrance to follow the ‘new’ road next to the aforementioned Old Seven Mile Bridge. 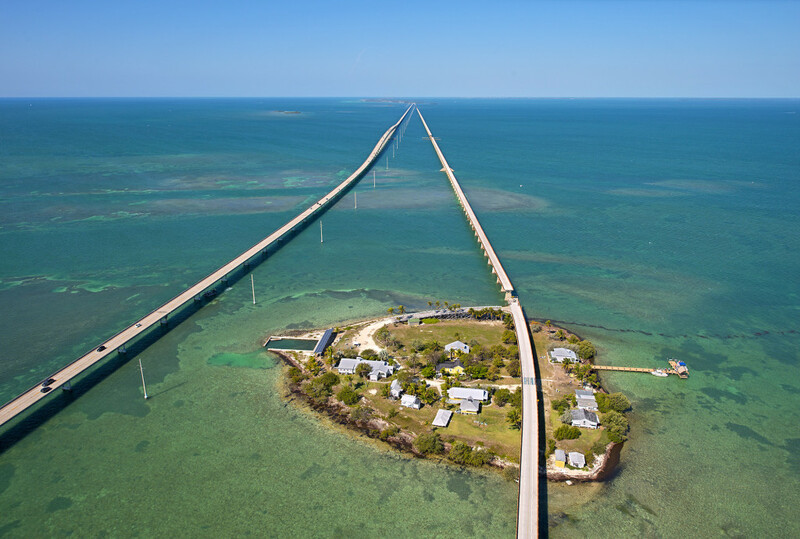 This is an amazing section of the Overseas Highway as you can marvel at this triumph of engineering and architecture on your left and the open turquoise waters on your right. 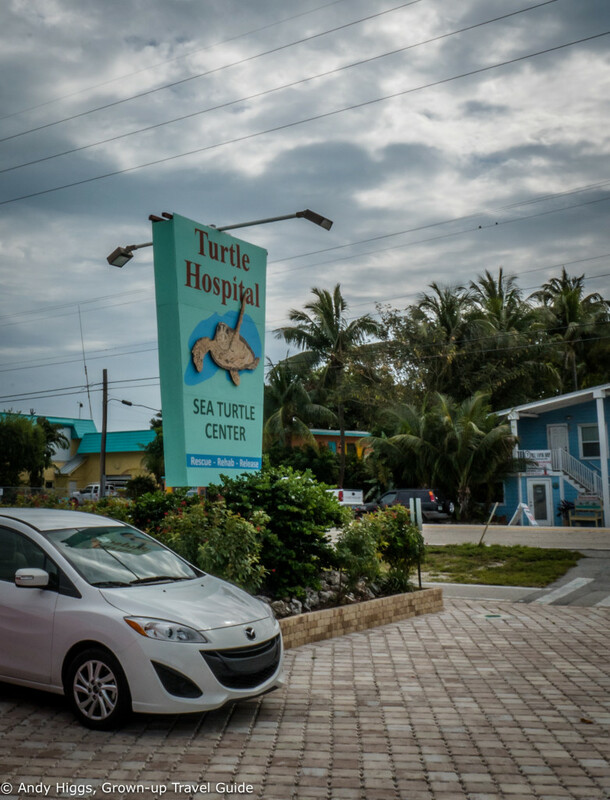 Since 1986, the Turtle Hospital has been pursuing its goals of rehabilitating injured seas turtles and returning them to their natural habitat where possible, educating the public, conducting research and working toward legislation to improve the beach and water environment to keep the turtles safe. 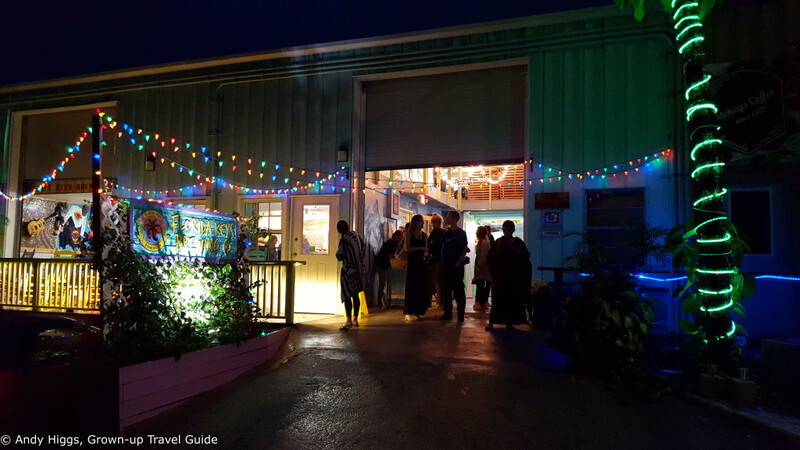 It’s an inspiring project – housed in buildings originally part of the Hidden Harbor Motel, guided educational experiences are offered to the public 7 days a week and are highly recommended. 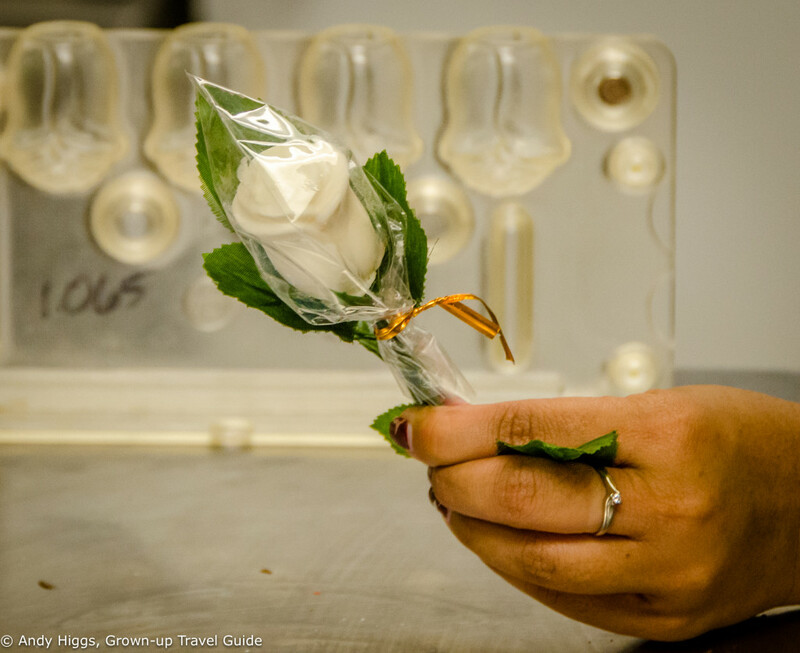 It’s worth making a reservation as these tours are popular – after signing a waiver we gathered in a screening room to watch a short film and listen to a presentation. 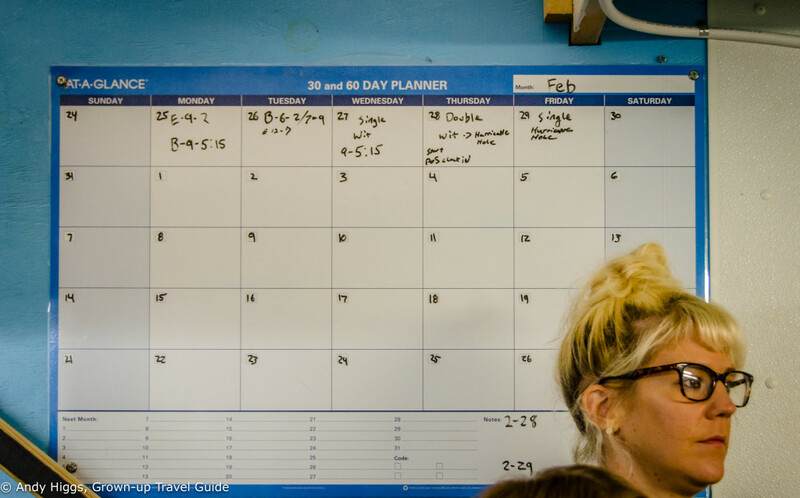 We were then walked through the premises including the operating theatre and surgery facility. Unsurprisingly, most of the problems sea turtles have to deal with are cause by humans. Fishing line is one of the worst offenders – but balloons and plastic bags (which look similar to jellyfish to these turtles as they have poor eyesight) are also a major factor. 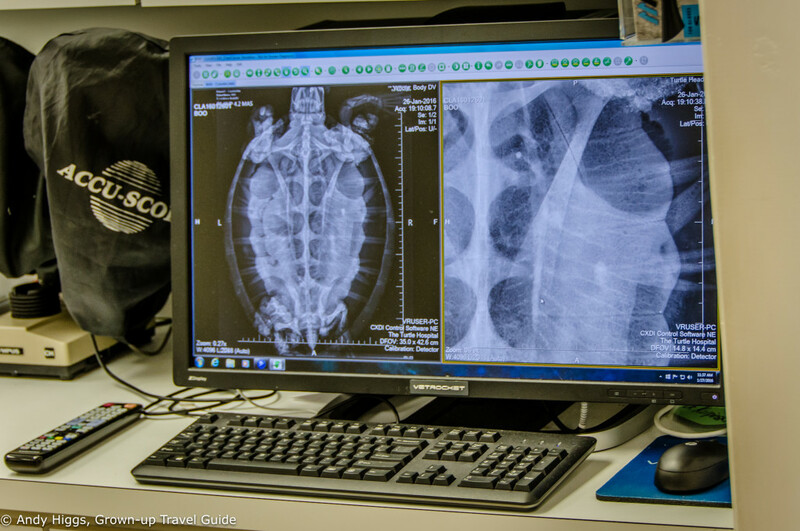 Viral tumours are also removed – these affect about half of all sea turtles throughout the world. 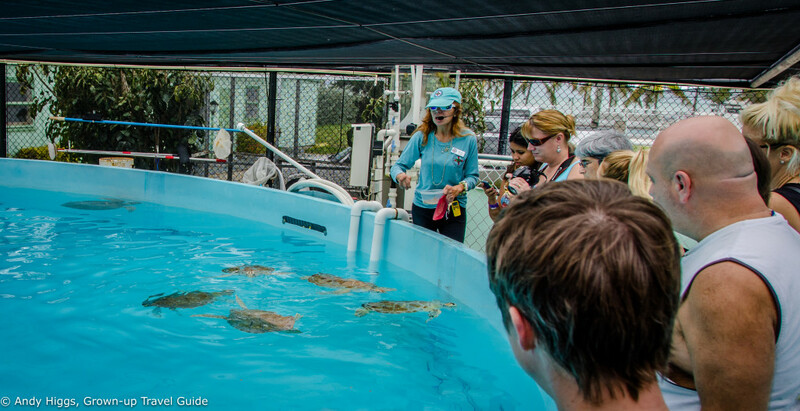 We got to see many turtles in various stages of rehabilitation – you should follow the website if you are planning a visit to see if a release is scheduled. 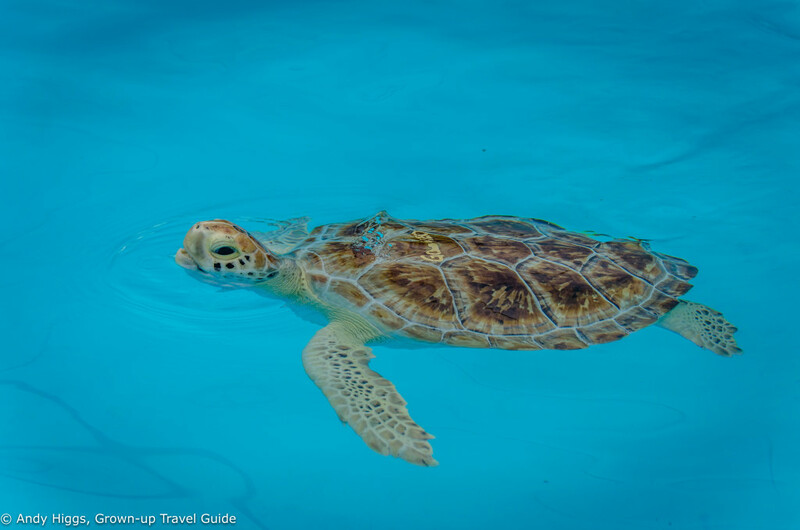 These are a huge local event when crowds gather to wish the healthy sea turtle bon voyage. 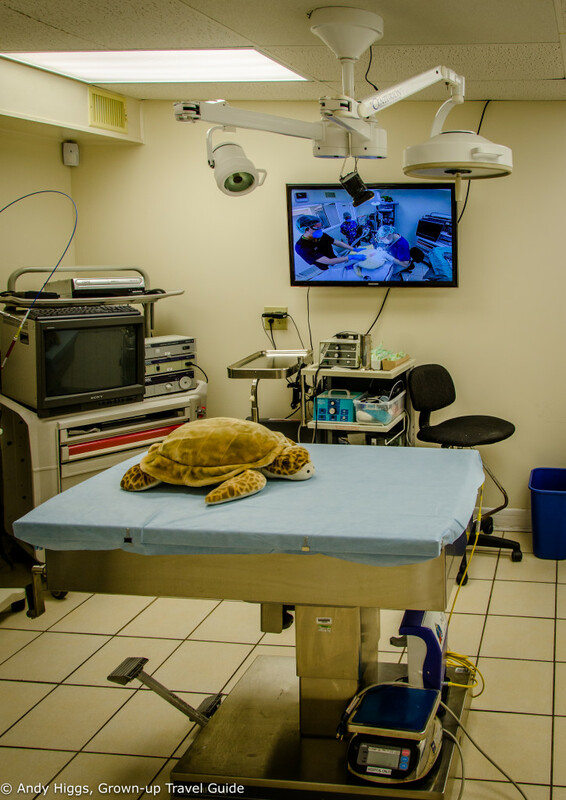 Over 1500 sea turtles have been treated and released by the Turtle since it opened but new patients arrive with sad regularity. 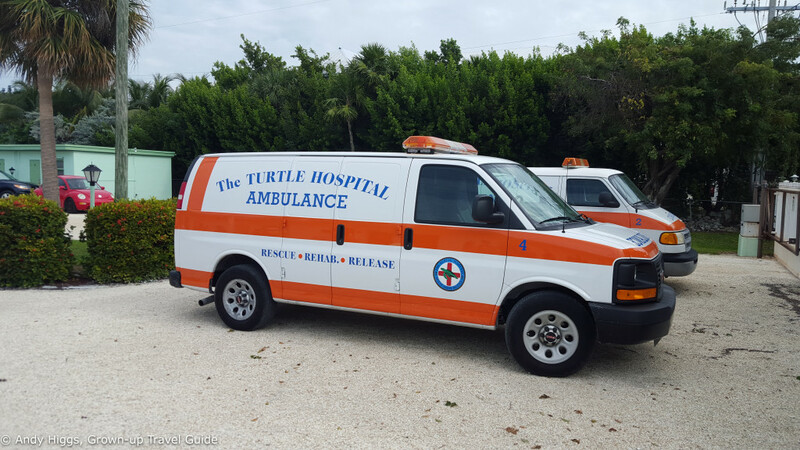 Still, it is great that they have a place to take care of them, and that the public knows to contact the hospital if they find an injured turtle. 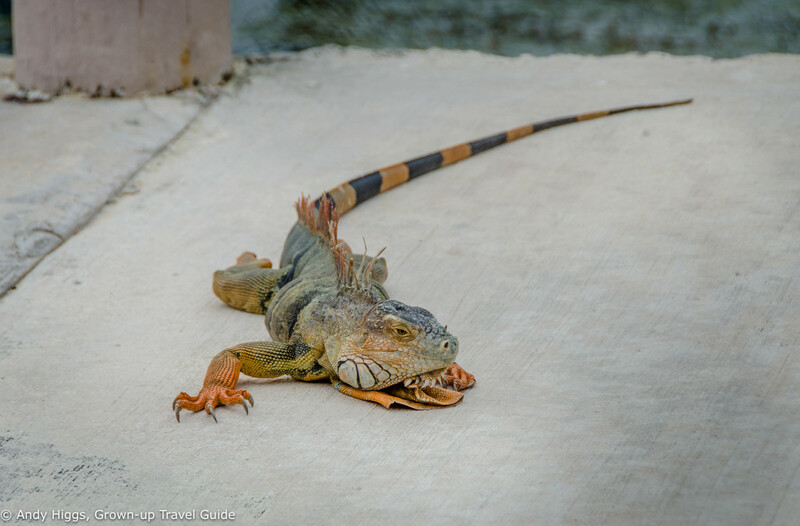 An iguana also crashed the party while we were there. Tours last about 90 minutes and are very informative. I had been really looking forward to this and although it was cloudier than I’d have hoped, it was worth the wait. 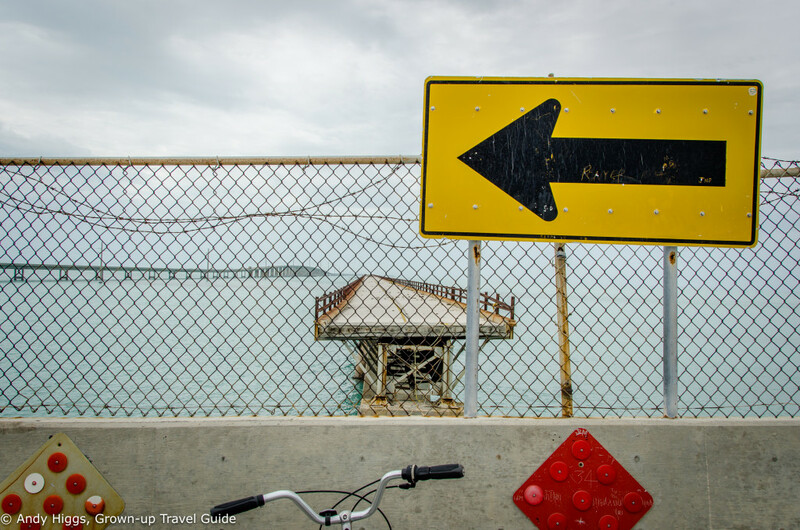 As I mentioned before, some stretches of the original railroad structure are open to the public as walkways and cycle paths – and the most spectacular of these is “Old 7” – the seven mile bridge that was built over a hundred years ago. In 1938 the bridge was converted to an extremely narrow road and was used by motorists right up until 1982 when the new bridge running parallel to Old 7 was completed. The latter then became a fishing pier and walkway but began to deteriorate in recent years, leading to calls to save it from destruction. 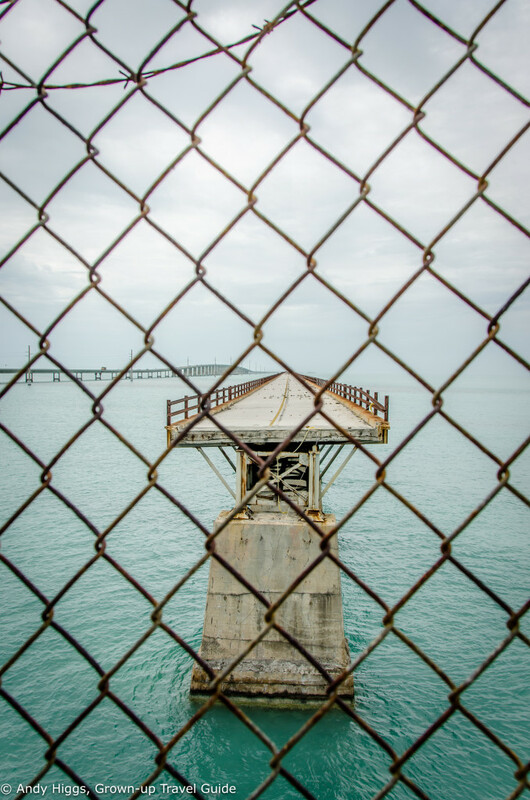 Happily the Florida Keys government and Florida Department of Transportation agreed on a 30 year plan to spend USD 77 million for the restoration and maintenance of the Old Seven Mile Bridge, ensuring that the preserved section can continue to be used by the public. We picked up our rental bicycles from the folks at Overseas Outfitters and headed for the bridge. We had very limited time but I was determined to bike as far as I could. The accessible section is about two miles long and ends abruptly at Pigeon Key where there is a substantial gap in the structure. It’s a great way to appreciate this beautiful old bridge and one you should definitely try when you visit. Now it was time for some food, of course. 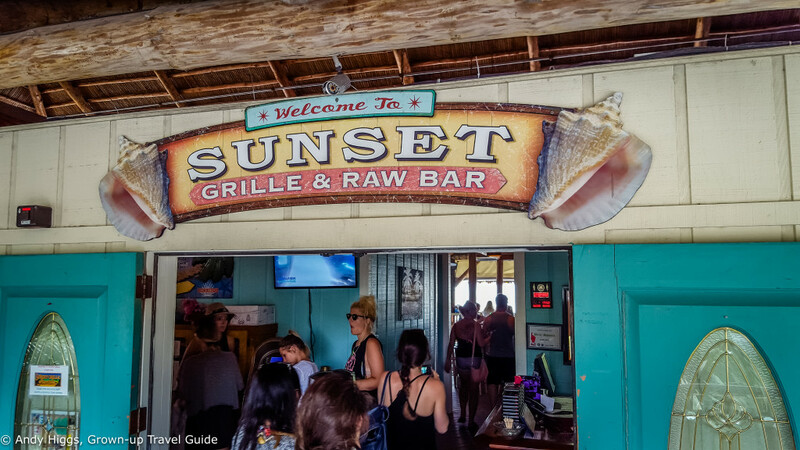 Sunset Grille is the perfect place to load up on calories, grab a cold beer or three and contemplate the slightly insane piece of construction that is the Old Seven Mile Bridge. 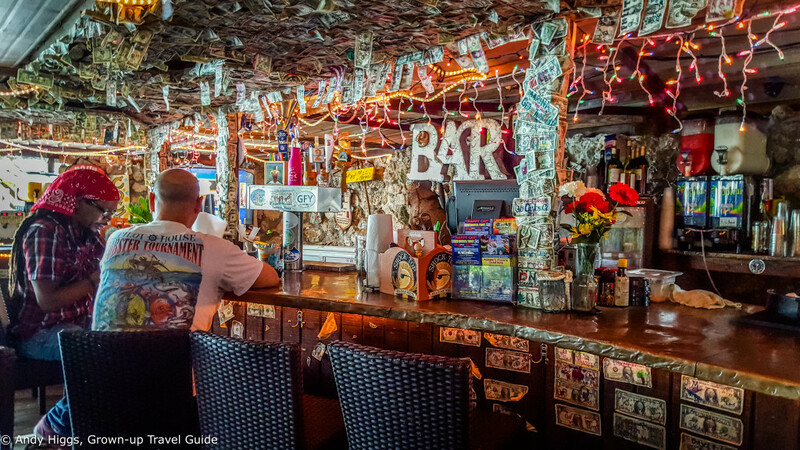 With unbeatable views of the former railroad and an excellent menu – and even a pool if you fancy a dip – this is a must-stop place on the Overseas Highway. My tip? 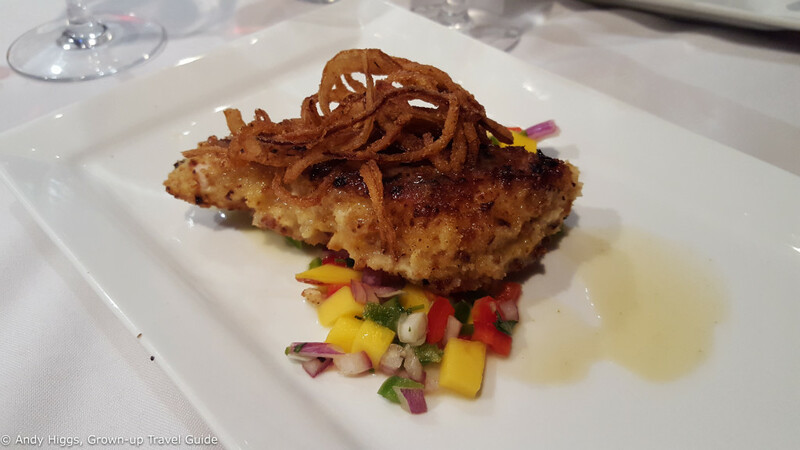 Try the coconut prawns for that ‘taste of paradise’. 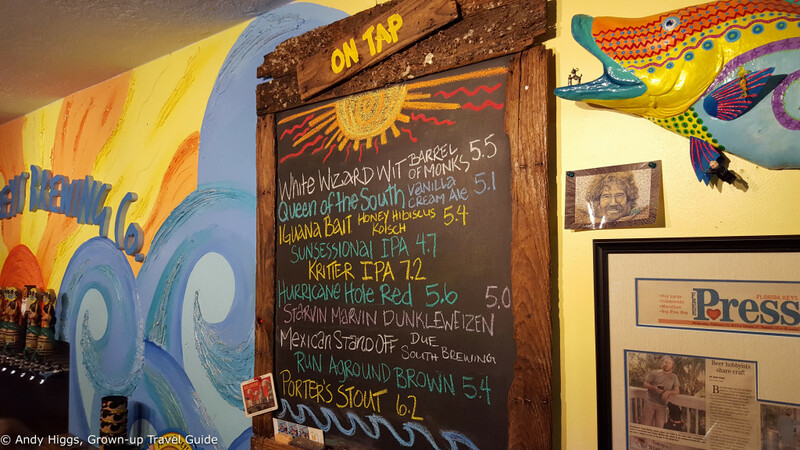 They have a couple of good craft beers, too. 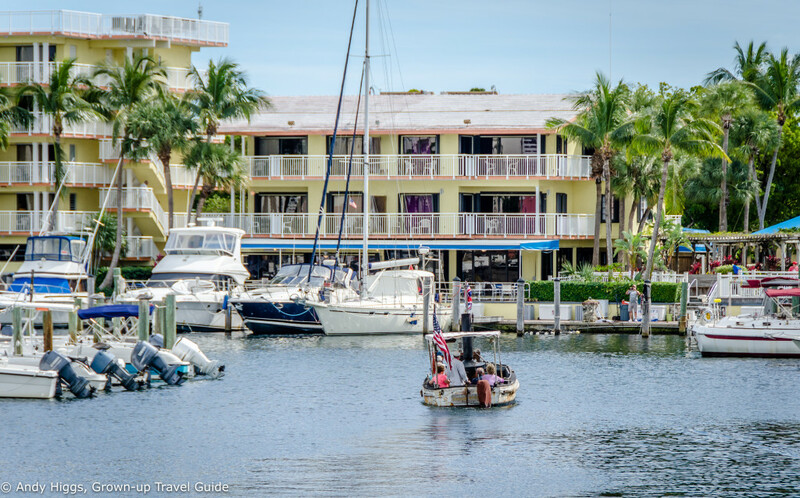 After a substantial lunch we set off for the hotel which would be our home for the rest of our time in the Keys, the Ocean Pointe Suites. I’ll publish a full review soon so we’ll pick up the story a few hours later. A quick rest, shower and change of clothes later it was time for dinner, believe it or not. 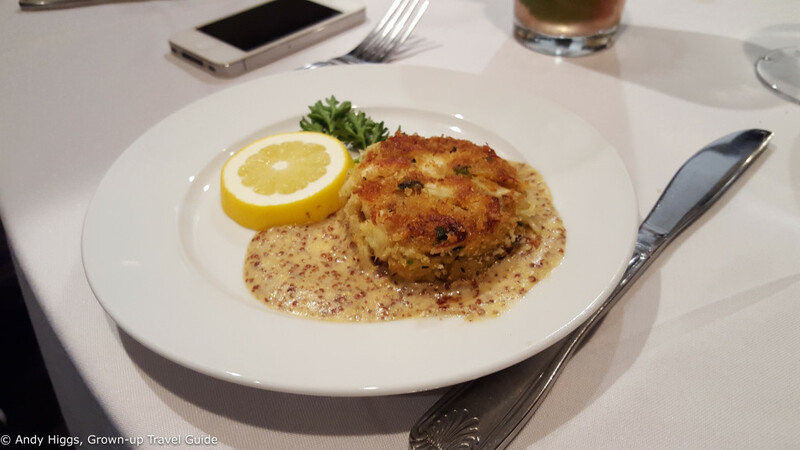 The Fish House is – no bombshell here – renowned for its fresh seafood, all of which is caught locally where possible. 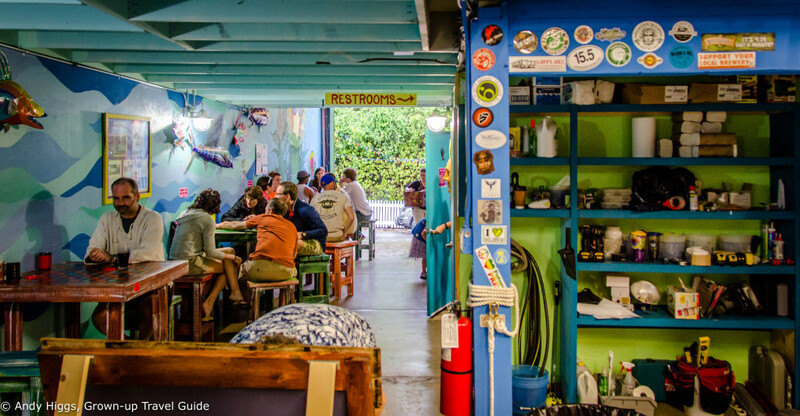 It’s a laid-back eatery directly on the Overseas Highway and is very popular. 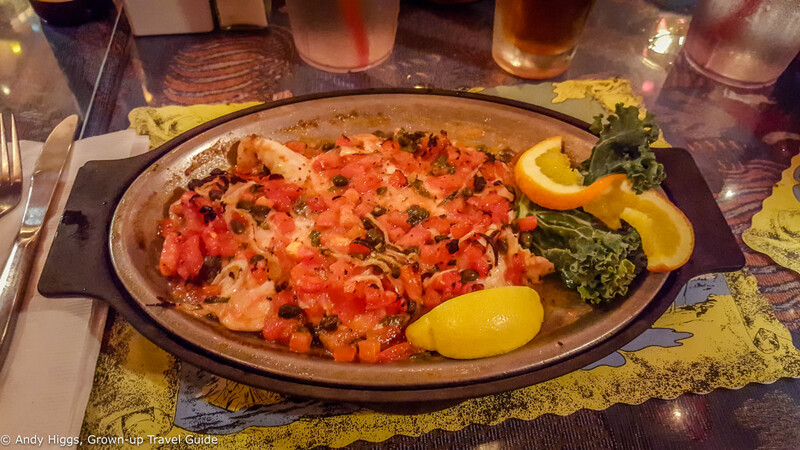 As has proved so successful I listened to the advice of people who had eaten here before and ordered the yellowtail snapper prepared “Matacumbe” style – the house speciality with tomatoes, capers, shallots and fresh basil. 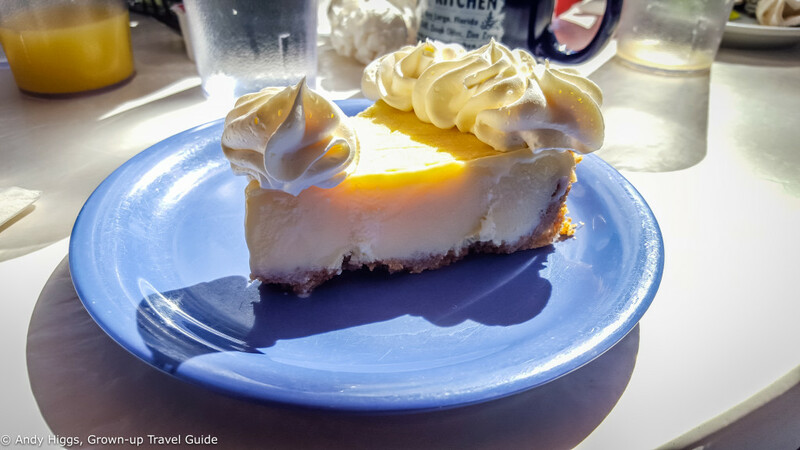 Naturally we had to try the Key Lime Pie for dessert, which was also great. After that, I went to bed in my enormous hotel room (an apartment in all but name) and slept like a log. The next day our plans to kayak to an abandoned island had to be, er , abandoned when the weather again refused to play ball, threatening to leave us stranded out there when the winds picked up. 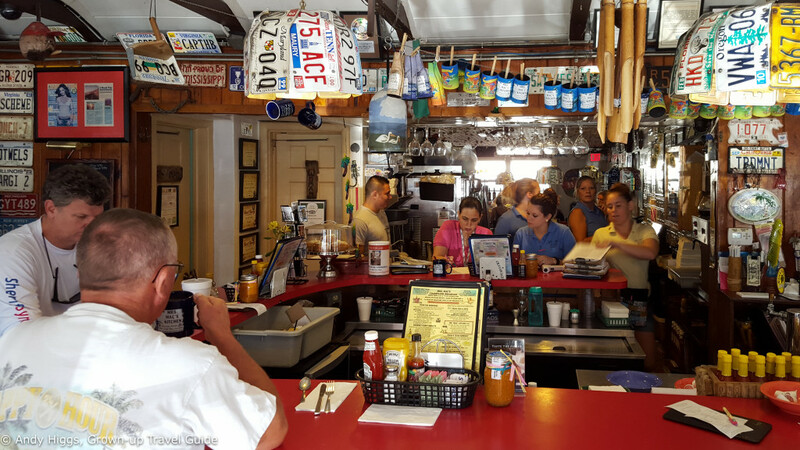 This left us to pursue other activities after breakfast, and meet for lunch at an Islamorada institution. 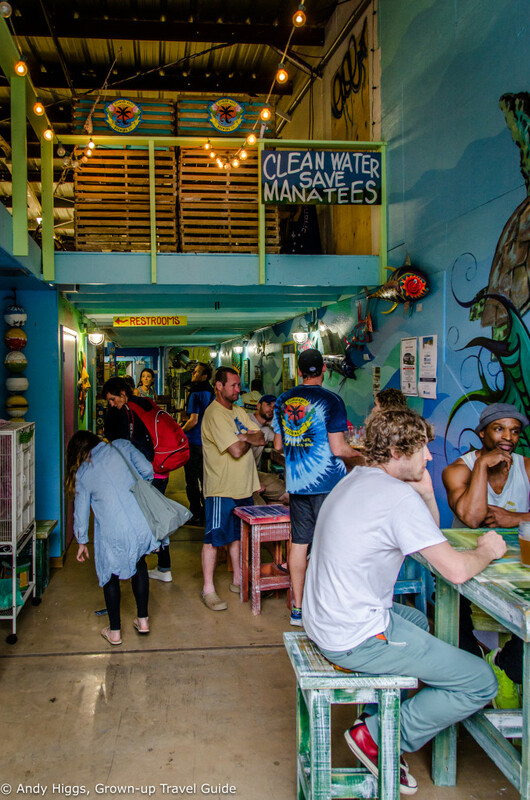 This place manages to successfully combine a marina offering fishing and sporting excursions, a market selling souvenirs, handicrafts and artwork – among other things – and an excellent restaurant and bar. You kind of get a feel for the place from the vendors’ offerings as you enter. 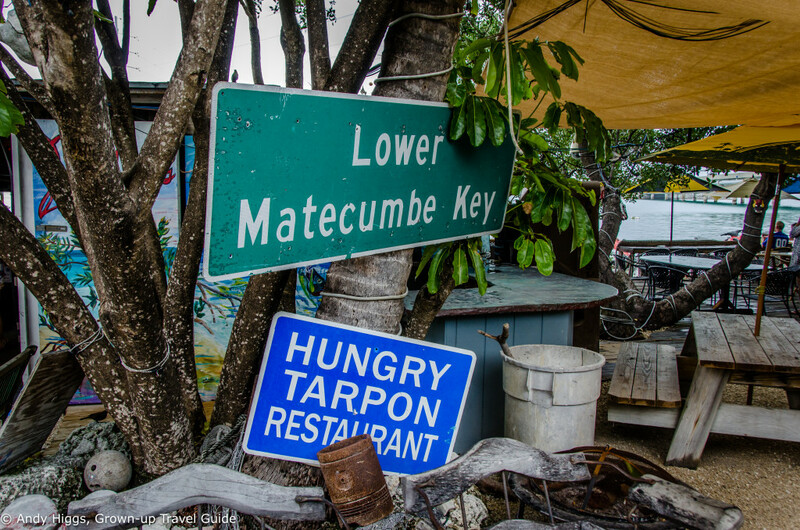 We were here to eat lunch – it may look a little shabby but that’s part of the appeal of the extremely relaxed Hungry Tarpon. 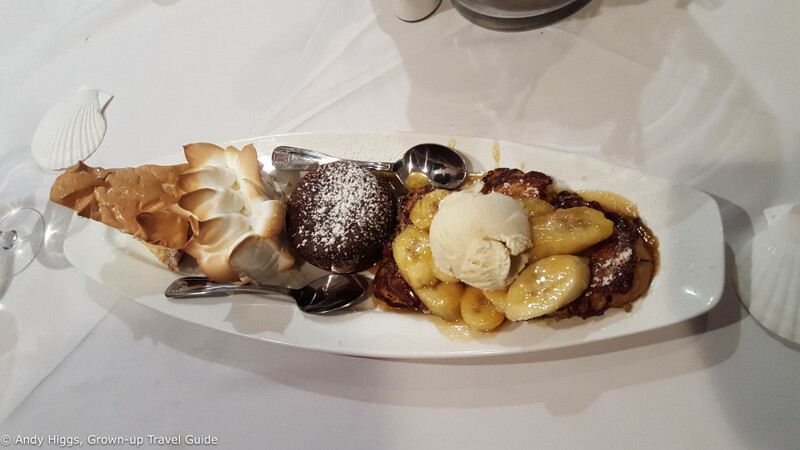 Despite what we’d heard I think we were all still a little surprised by the fantastic food we had here. 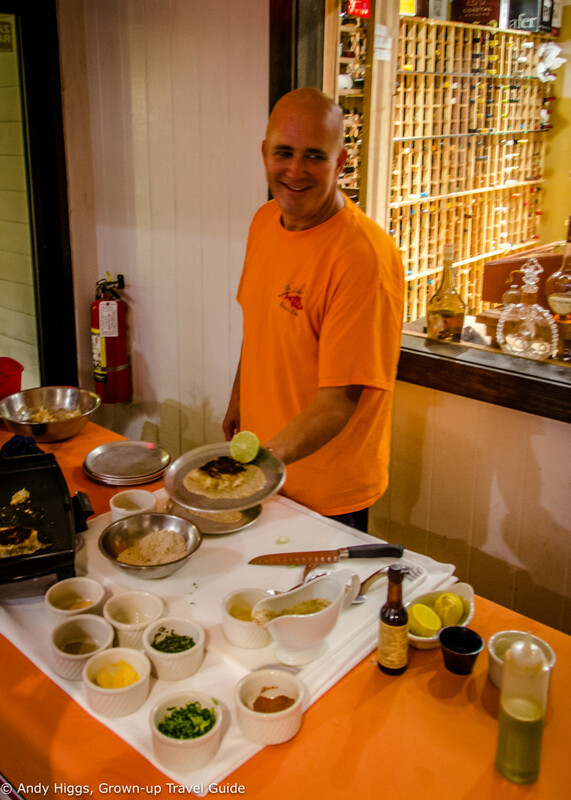 I chose the fish tacos which were excellent, extremely fresh and well seasoned. Washed down with a craft beer, it was a perfect lunch and I was but one of many happy campers. Now it was time to feed the fish. 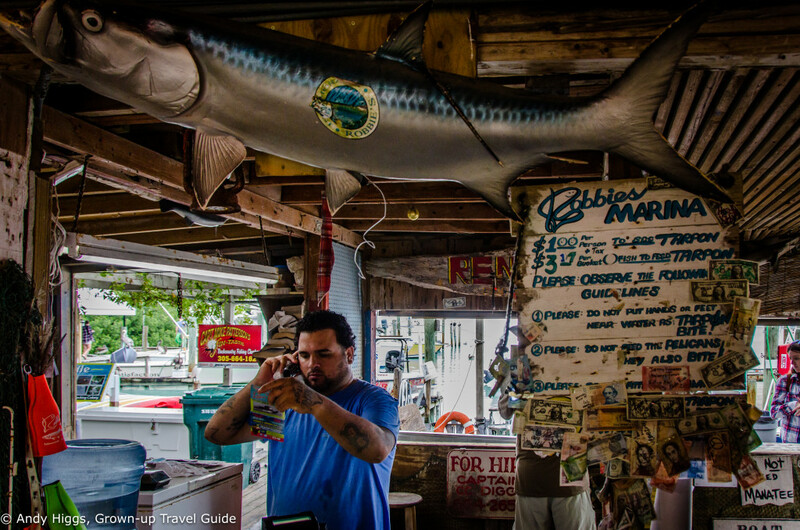 Tarpon are huge, ugly and inedible. They eat other fish and have razor-sharp reflexes, so a certain amount of care is needed when feeding them. You also need to make sure you don’t drop anything in the water or you risk it ending up on this ‘lost property’ board. 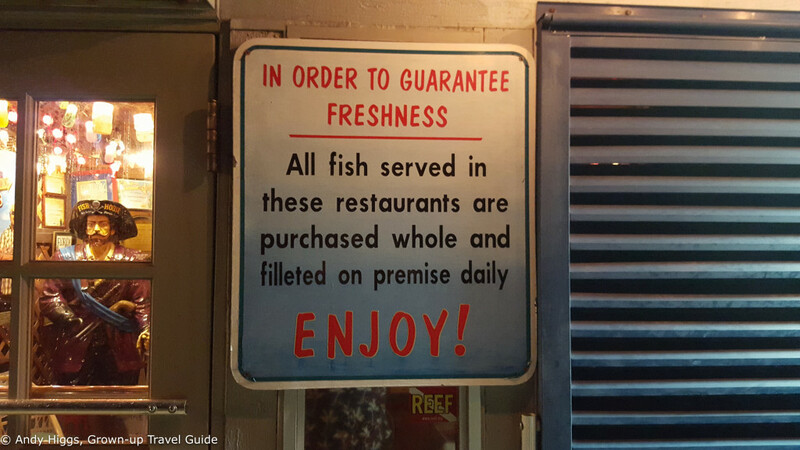 Here at Robbie’s you pay your fee for a bucket of small fish which you then take out to the dock where the tarpon are found in a small enclosure. The fish stay below the surface and were hard to see on our visit due to unusually murky waters. You can watch the feeding process about a minute into the video – but watch it all for the entire Robbie’s experience. The whole place is swarming with pelicans so keep your wits about you. Pelicans are, as our Keys PR rep so succinctly put it, “***holes”. They hassled us the entire time we were trying to feed the tarpon and are seemingly immune to abuse and threats. Anyway, they get fed well here, cleaning up all the leftovers at the dock. Another thing that’s cool about Robbie’s is that several scenes from Bloodline were filmed here. Don’t worry, I have a hugely detailed Bloodline locations article coming up, so no need to dwell on that now. Oh yes. 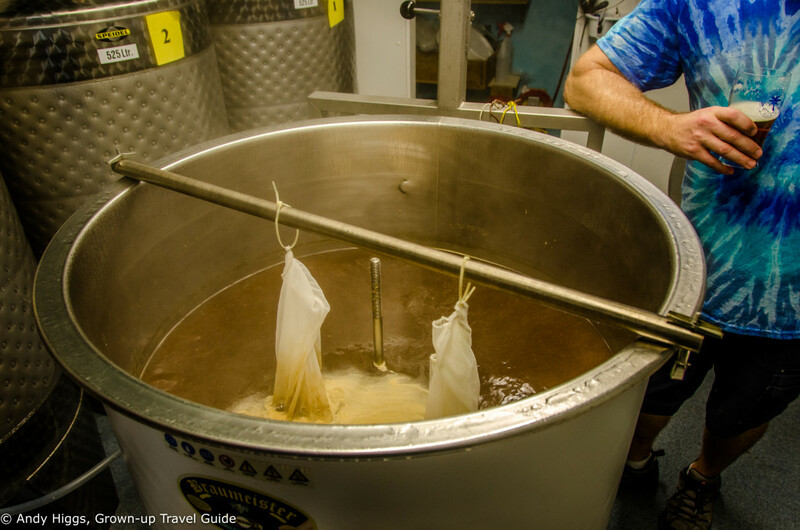 As a newbie home brewer myself, I enjoy talking to people who have made the step from hobby to career beermaker, but often hear (frankly rather unbelievable) stories of how it loses its fun when you start doing it for money. 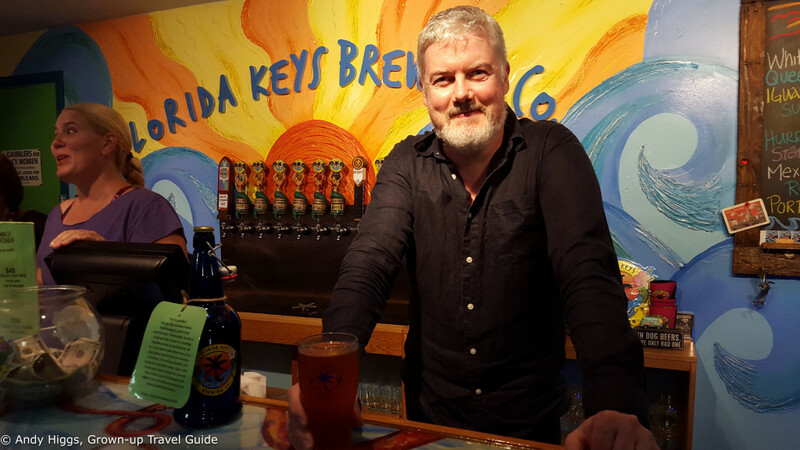 Well in this case it wasn’t like that – Canadian Craig and his Floridian wife Cheryl recently set up Florida Keys Brewing Company, incredibly as the first craft brewery in the Keys. 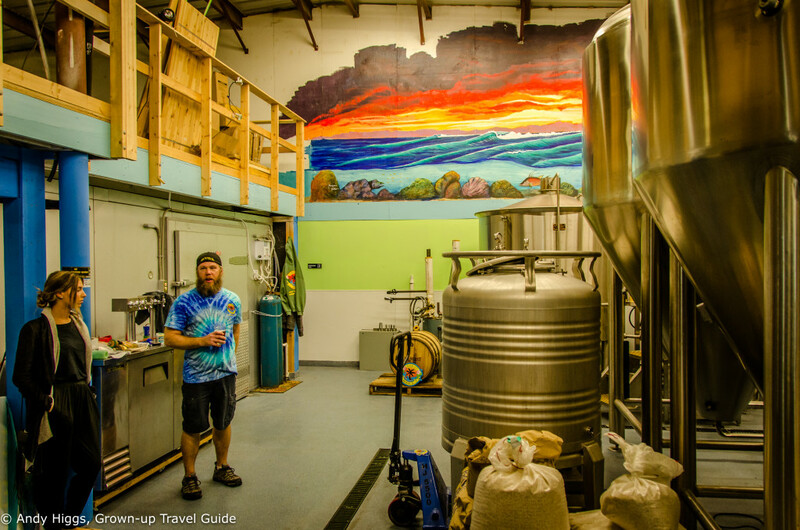 He loved brewing and was often told his beer was great, so when they decided to move back to her place they decided to go all in and start a brewery. It’s been a roaring success, fitting in perfectly with the hip street in which it is located and combining cool design, local artwork and of course cracking beers. 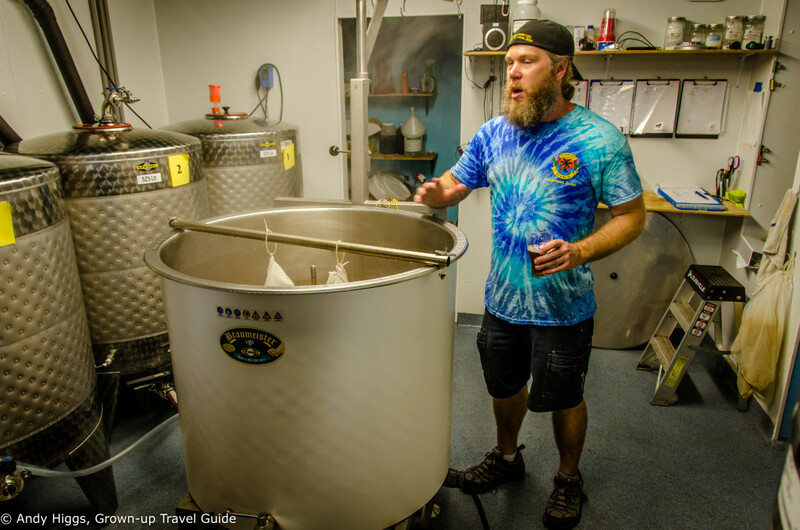 At present it’s tap beer only, served on the premises but the equipment is in place to ramp up production soon and produce keg beer for sale in other local bars and restaurants. 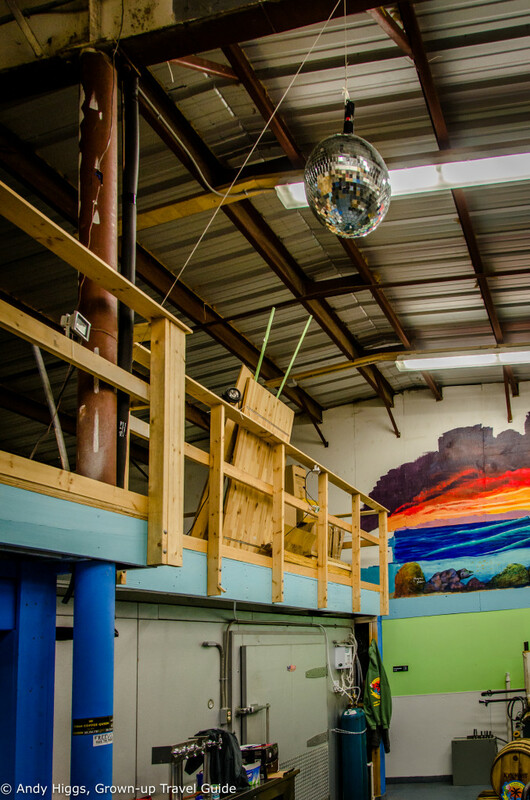 Oh and it may be the only brewery with a disco ball. As you can see, it’s a (rightly) popular place and was pretty well full when we visited, early on a weekday evening. The colourful logo fits the Keys style perfectly. 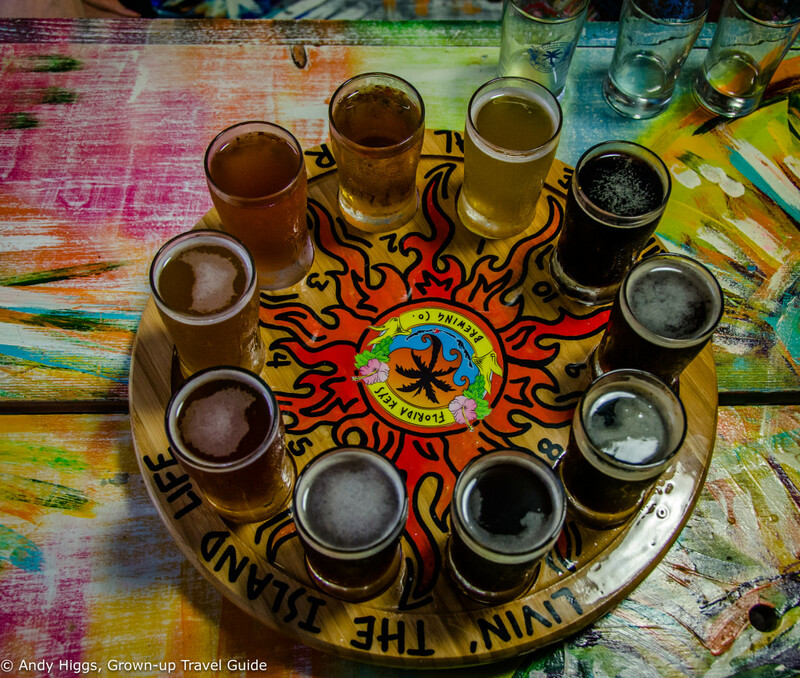 Soon it was time for a little tasting – and what a range! 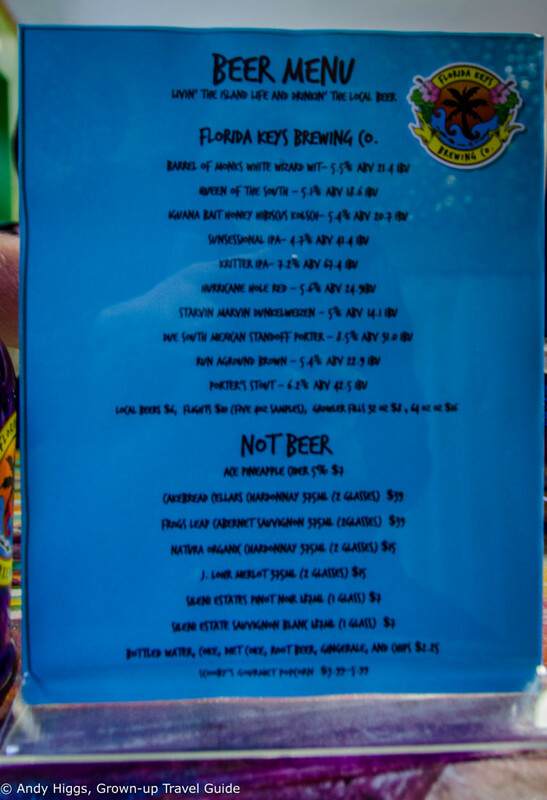 If you had to push me for my favourite I would probably go with the Kritter IPA, but need to return for more thorough research. 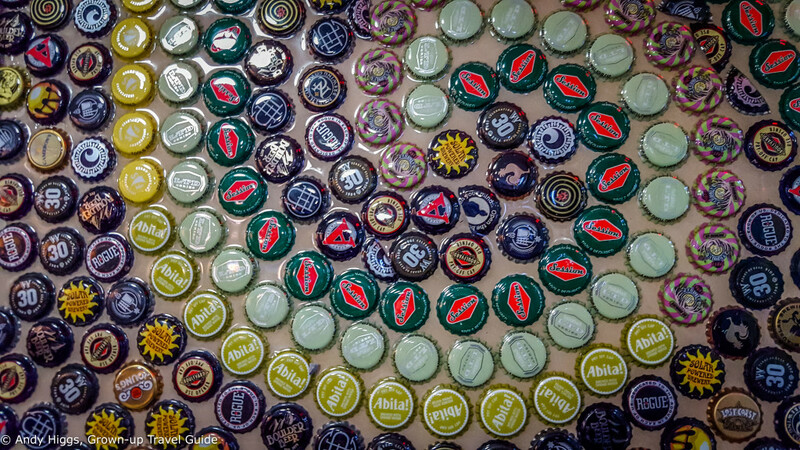 Naturally enough they even use key limes in one of their beers but it was still at the fermentation stage when we visited, so that will have to wait for my next trip. 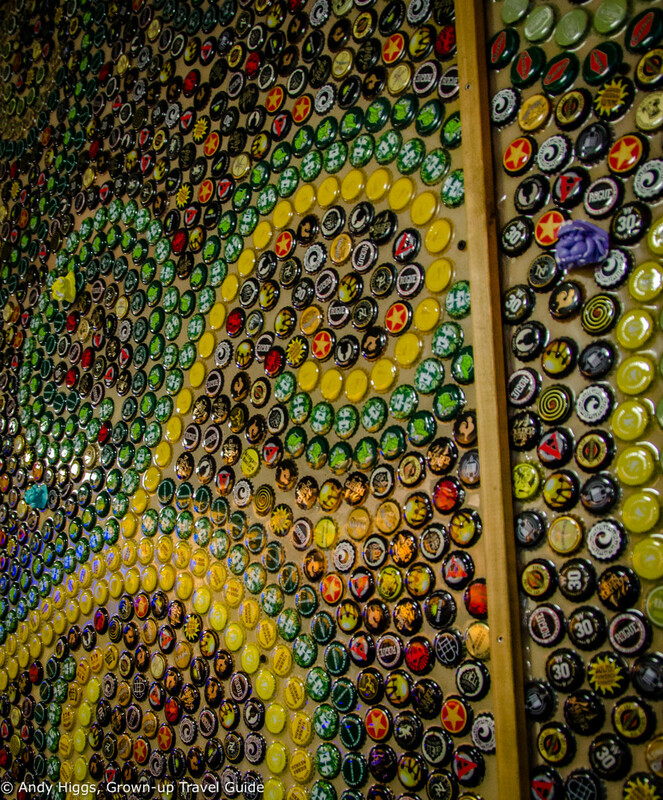 The walls are beautifully decorated with beer tops – Cheryl asked all the breweries they could think of to send them some and created the design – and it worked a treat. Chances are you’ll recognise a few of these as they come from all over the world. Sadly, and far too early, it was time to leave. 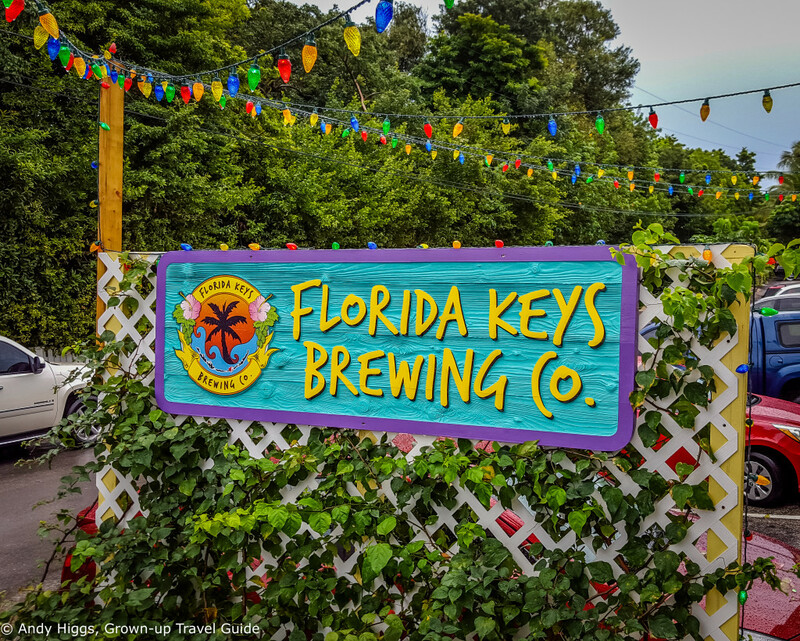 Do not pas through Islamorada without stopping at the Florida Keys Brewing Co. – in fact why not stay nearby so you can make the most of it? 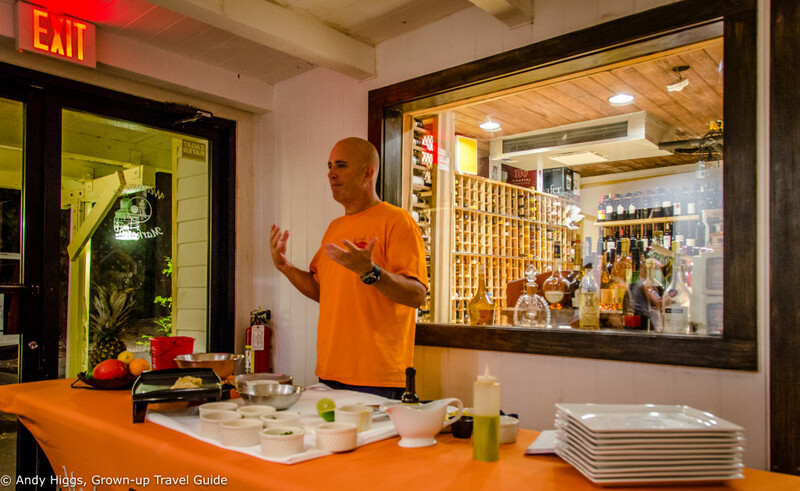 One of the most famous restaurants in Islamorada and the entire Florida Keys, Marker 88 is located on one of the few natural beaches in the area and serves seafood, steaks and chicken dishes in a relaxed yet elegant atmosphere. It’s also a favourite with Kyle Chandler and the rest of the Bloodline crew, but that’s another story. With high winds and even a little rain, we were seated indoors but the outdoor area would be amazing at sunset on a ‘normal’ Keys day. Anyway we were privileged to not only be treated to a stupendous meal, but to have top chef and owner Bobby Stoky demonstrate how to cook one of his specialities for us. Essentially self-taught, he has certainly learned fast. He made it look easy and insisted it was, but I highly doubt I could make crab cakes as good as his and it’s probably just as well we weren’t asked to participate. We were served dish after fantastic dish. Marker 88 also has a well-stocked wine cellar, although we made a small dent in their stock that night. Clearly, this is yet another place to return to. And another one for your list. But we weren’t quite done yet – and managed to fit in a lot into our final morning. After packing our bags and checking out we were off for breakfast. 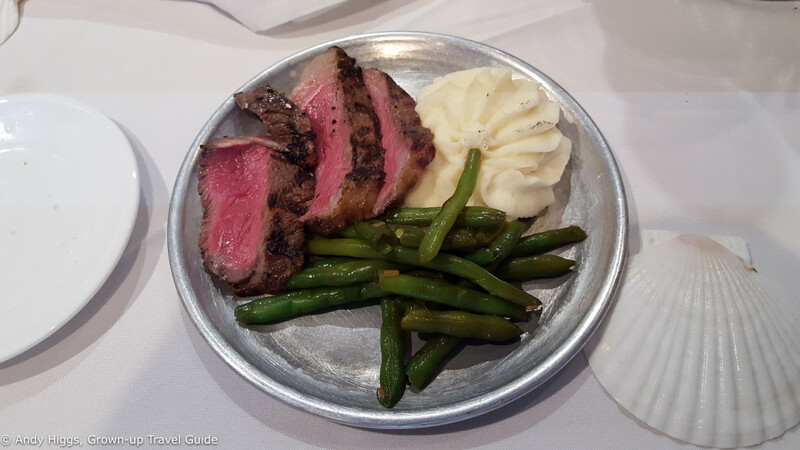 Another legendary restaurant, Mrs. Mac’s Kitchen is much-loved by locals and tourists alike. As well as the original location that opened its doors in 1976 (the one we visited here), a new branch opened in 2012 a little further down the road towards Key West. 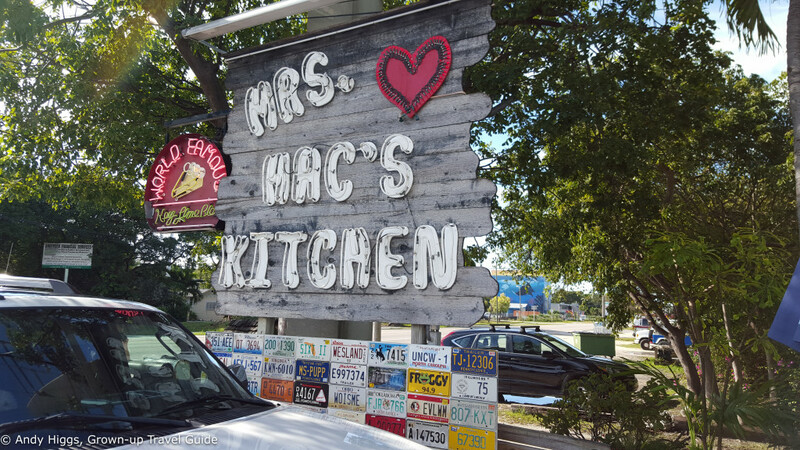 The latter , known as Mrs. Mac’s Kitchen II, featured in Bloodline, so more on that in a future post. 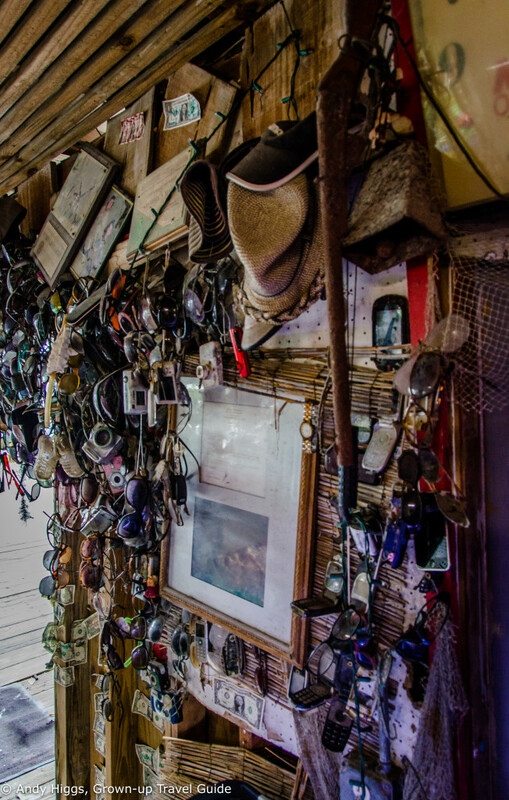 Decorated with a ridiculous number of license plates donated by customers, Mrs. Mac’s is famous for its huge breakfasts but is just as popular for lunch and dinner. 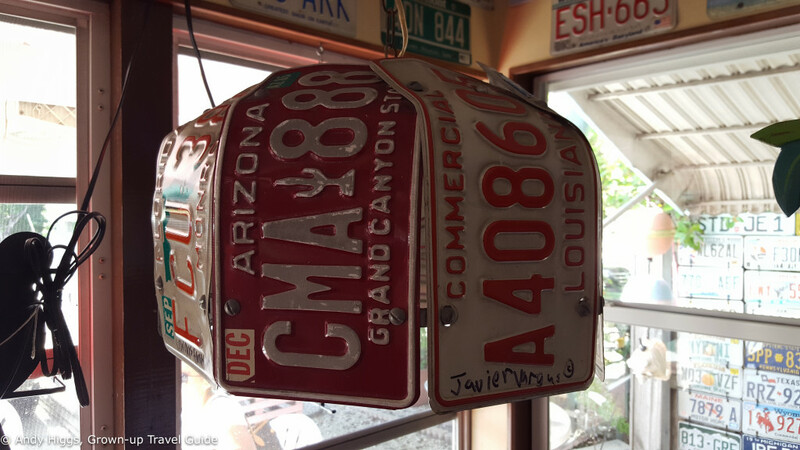 Now that’s creative – a lampshade fashioned from license plates. 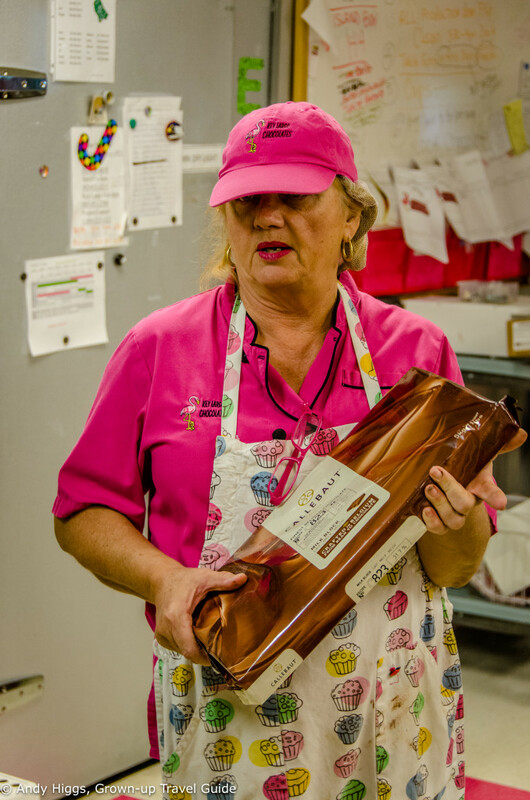 The motto of Mrs. Mac’s is “Eat Well, Laugh Often, Live Long”. I couldn’t agree more. I went for Mrs. Mac’s Famous Mornwich – a fresh pita bread filled with two scrambled eggs, cheese, tomato & mayo with Canadian and homemade hashbrown casserole. 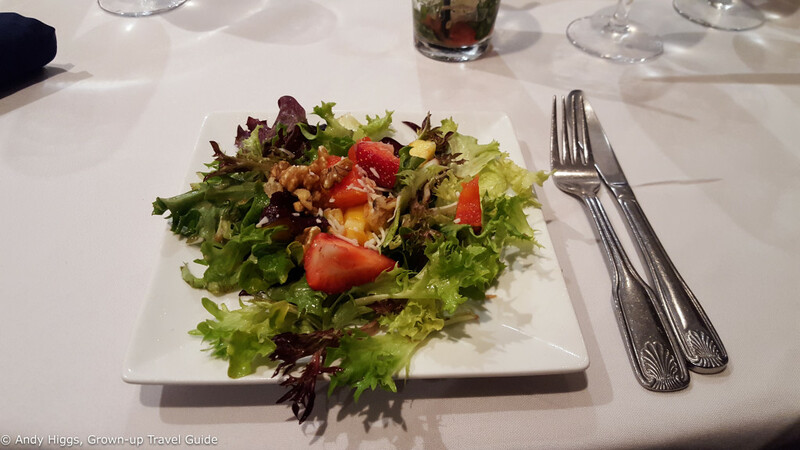 Don’t even ask about that last item – healthy, it ain’t, Tasty, it is – as was the whole shebang. 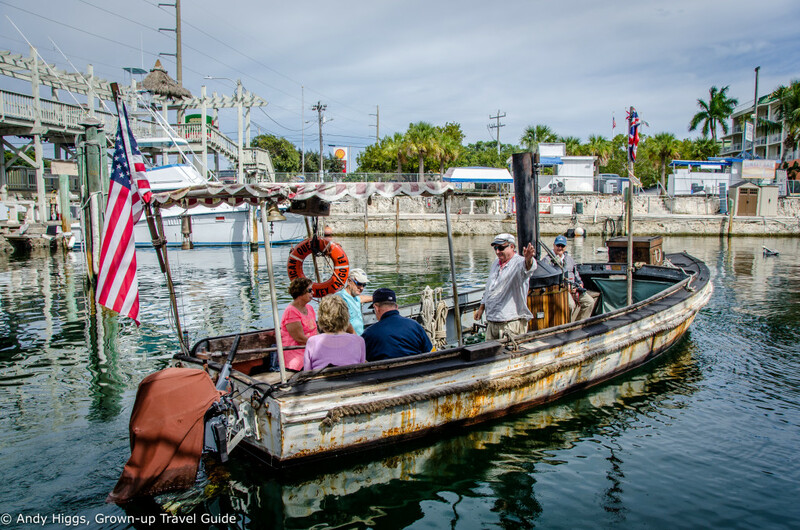 The original vessel from the classic John Huston film “The African Queen” with Humphrey Bogart and Katherine Hepburn now resides in Key Largo – the name of another Huston/Bogart classic, which wasn’t actually filmed here. Only the opening scenes showed the real Florida Keys. 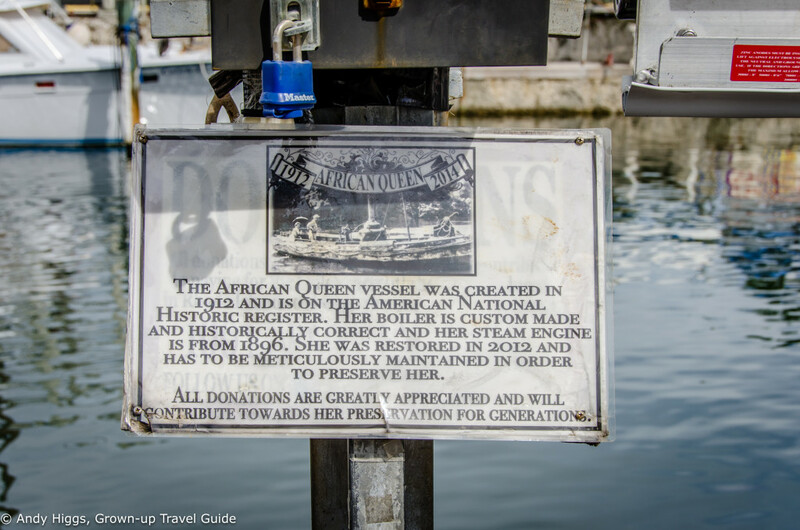 But I digress – this is the real boat and these days you can catch a ride and enjoy a bit of movie history. As the African Queen disappeared in the distance, we crossed the road again for one last Florida Keys treat. 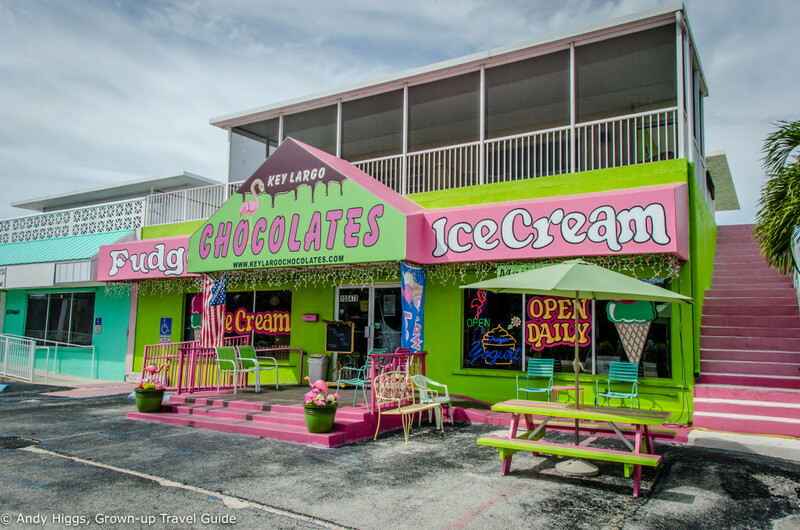 It’s hard to miss this colourful chocolate factory right on the Overseas Highway. 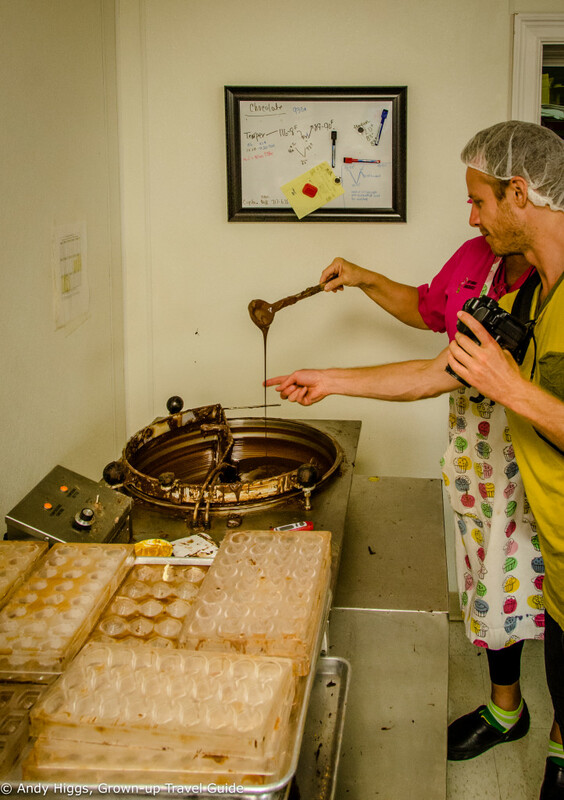 Kristie and Bob Thomas started their venture with the aim of producing hand-made high quality chocolates from natural ingredients. 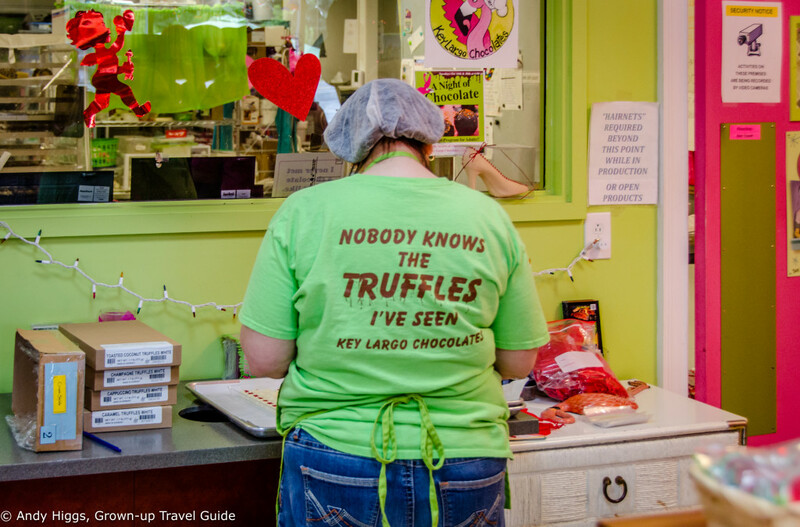 Truffles, as this nice pun suggests, are a big part of their output. Now THAT’S a chocolate bar. Five kilos, to be precise. Yes, we got to taste it too. 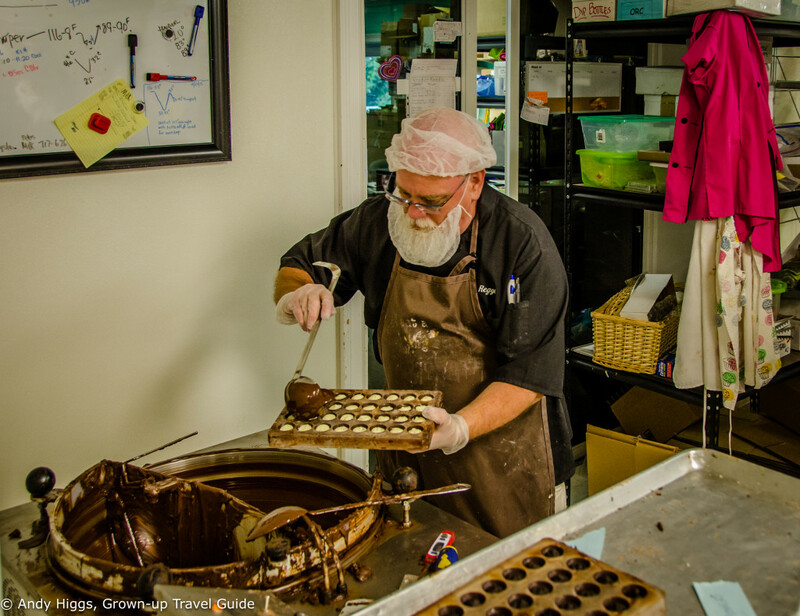 Here chocolate is poured into moulds before cooling. 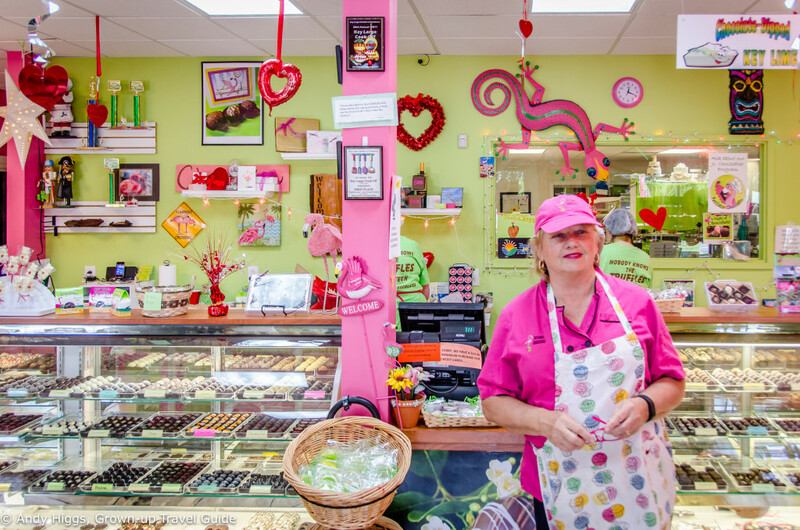 They also sell excellent ice-cream and in case you were wondering, chocolate-dipped Key Lime Pie is great – how could it not be? And that, my friends, was the end of the journey on this occasion. We left Key Largo for Miami International Airport for home, which in my case took some 28 hours. 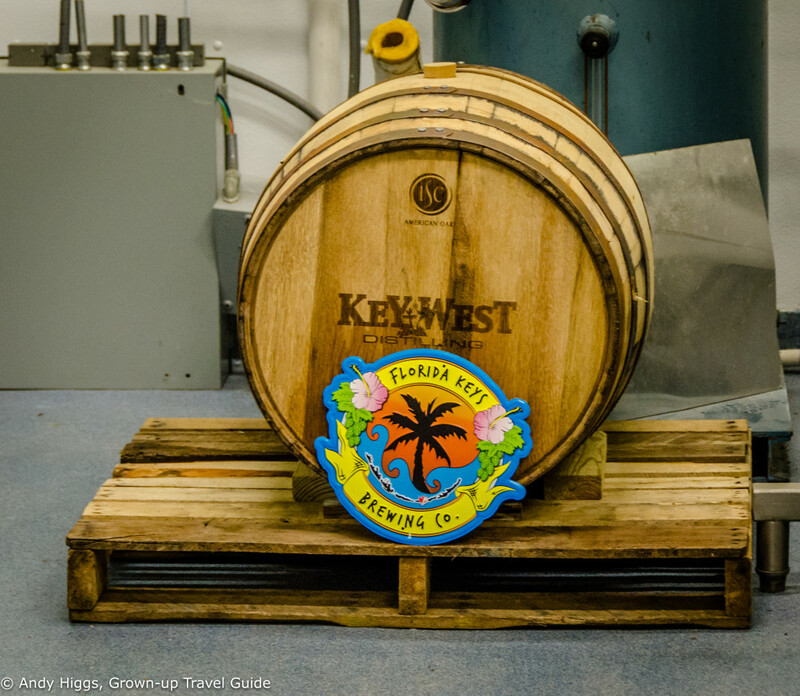 But it was absolutely worth it – with so much to do in Key West and the rest of the Florida Keys, what are you waiting for? Check out the official website for all you need to know!